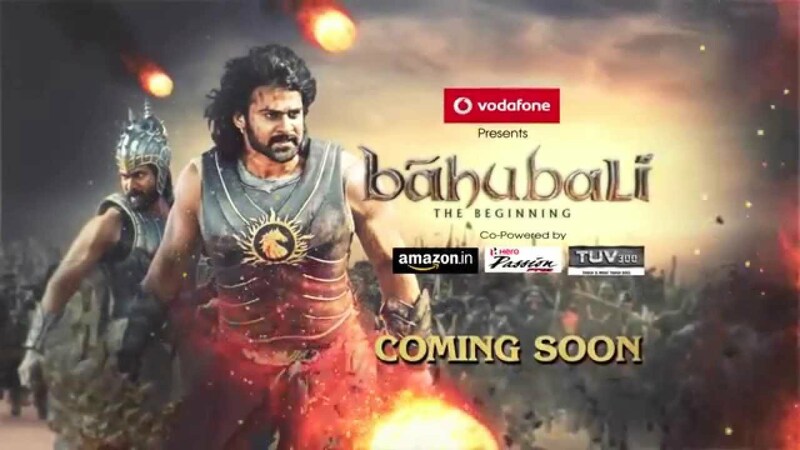 Hindi movie channels Sony Max is all set to present the world television premiere of Prabhas’s recent movie ‘Baahubali - The Beginning’ this October. "Baahubali - The Beginning" is a fantastic period movie never made before in the history of Indian cinema. The movie boasts of an interesting storyline and sterling performances by the lead actors. In the ancient Kingdom of Mahishmati in India, Sivagami, the queen mother (Ramya Krishnan), carrying a baby in her arms, emerges from a cave directly next to a very big high waterfall. After killing off soldiers pursuing her, Sivagami decides to save the baby by letting herself drown in the river, while keeping the baby held atop her hand. Local villagers spot the stranded child and save the infant. Sanga (Rohini) and her husband name the infant Shivudu (Shivu in Tamil) and raise him as their own son. To prevent anyone from coming for the baby, they seal the cave with a large rock. Shivudu (Prabhas) grows up aspiring to climb the waterfall which irks his mother as she does not want to lose her son. He attempts again and again to climb the massive waterfall but fails. Sanga asks Swamiji (Tanikella Bharani) for a solution who tells her that she has to pour water on Shivling 116 times for her prayers. When Shivudu finds out about it, he picks Shivling on his shoulders and puts it below the waterfall. From the top of the falls, a mask falls in to the lap of Shivudu. He creates an imprint of the person whom the mask belongs to, a beautiful girl. He tries again to climb the waterfall and seeing visions of the girl whom the mask belongs to, succeeds. On top of the waterfall, Shivudu, now called Shiva, discovers that the mask belongs to Avanthika (Tamannaah), a rebellious warrior whose group has indulged in a guerrilla warfare against king Bhallala Deva (Rana Daggubati) of Mahishmati Kingdom. The group intends to rescue former queen Devasena (Anushka Shetty) who is the real mother of Shiva and she has been chained in the palace center dais by the king for the past 25 years. Avanthika is given the next opportunity to attempt a rescue mission for the queen. Avanthika initially doubts Shiva's intentions, but later falls in love with him after she finds out that he has climbed the waterfall for her. Shiva pledges to help her in her mission and sneaks into Mahishmati to rescue Devasena. There, the king's Royal Guard Kattappa (Sathyaraj), known for his great warrior abilities, attack Shiva with his group upon the order of the King. After Shiva beheads Bhadra (Bhallala Deva's son), Kattappa drops his weapons on realizing that Shiva is Mahendra Baahubali, the son of late king Amarendra Baahubali. Shiva's adoptive family travel through the cave to join the others and witness the events. A flashback reveals the animosity between cousins Amarendra Baahubali and Bhallala Deva, whose father is Bijjala Deva (Nassar). Bijjala was denied the throne as he had a disfigured hand from birth, and his brother Vijayendra became the new king. This creates a hidden enmity in Bijjala Deva's mind. Vijayendra died at a young age and Amarendra Baahubali is born within the next few months, though his mother dies at childbirth. Sivagami, with the help of Kattappa kills the rebelling ministers of the kingdom and becomes steward till a new king is crowned. Amarendra Baahubali and Bhallala Deva are brought up together, but Bijjala Deva poisons Bhallala's mind to get the throne. The brothers are both trained in all areas including arts, science, disguise, politics and warfare, but both of them have different approaches towards kingship. Amarendra Baahubali is liberal to everyone but Bhallala Deva is violent and achieves his goals with any means possible. When a war is waged by another kingdom, they both are guided by Sivagami that whoever brings the head of the enemy Ruler will be rewarded as the New King. While Amarendra Baahubali uses his skill, cunning and ability to crush the enemy, Bhallala Deva uses all the resources of the army, killing innocent people as well as the enemy, to win the war. The wise Sivagami announces Amarendra Baahubali as the new emperor because of his nobility and leadership in the war. Bhallala Deva is appointed as the general of the army. Kattappa and the others worship him as the king. After the flashback, Sanga wishes to see Amarendra Baahubali but Kattapa tells everyone that the king is dead and tearfully reveals himself as the killer. Baahubali - The Beginning was released on July 10, 2015. Baahubali : The Beginning is the first non bollywood Indian film to gross over 500 crore (US$75 million) worldwide.